Snakes are cold-blooded reptiles; they require external heat to keep warm. Snakes in the wild enjoy sunbathing on rocks under direct sunlight; snakes living in human-occupied areas are attracted to cars that are easily heated by the sun. 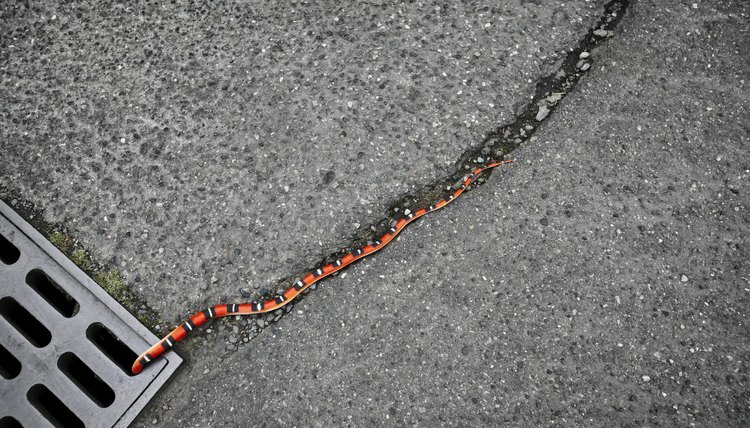 Snakes use heated cars to sunbathe like they do in the wild. Removing snakes from a car is dangerous, especially if they are poisonous. Small, passive and nonvenomous snakes are easily removed by using a broom or other long-handled object. Find the snake in your car; keep your distance to avoid being bitten. If the snake is within view, use a broom to gently push it towards an open door. Use the broom end to sweep the snake from the car while standing at a distance. In a populated area, use a bucket to catch it and then release it in the wild. Nonvenomous snakes are safe to handle while using precautions to avoid bites. Soak a burlap sack thoroughly in clean water; wring it out but do not dry it completely. Place the sack inside a dry sack; use more than one dry sack if needed to create a dry exterior appearance. Place the sacks inside your car; snakes are attracted to warm, moist areas they can hide in. Check the back every day for trapped snakes. A glue board is a long piece of wood coated on one side with a sticky substance. Purchase glue boards at hardware stores, or make your own glue board by covering a board in sticky sheets meant as rodent traps. Place a glue board inside of your car; place it on the floor against the doors or under the seats. Glue boards are useful for catching snakes in a humane way. Release the snake using vegetable oil. Many states outlaw the handling of wild, venomous snakes; when a venomous snake is found, state or local wildlife control is called. When nonvenomous snakes are captured and can't be released locally, wildlife control takes them to an appropriate place in the wild to release them. Wildlife control agents are trained to handle dangerous and venomous snakes; they can catch a snake in enclosed areas such as cars. Call wildlife control to remove snakes from cars safely.